Baseball cards aren't just for kids anymore, nor are the subjects related only to baseball. Topps, Upper Deck, and many other sport card manufacturers have created presidential cards. Here are some cards that honor Abraham Lincoln from Topps. 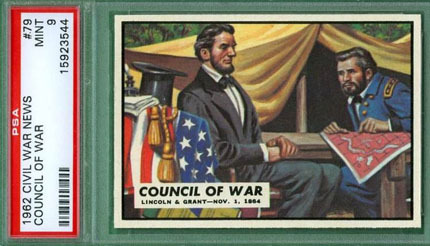 The 1962 Topps Civil War News series includes Abraham Lincoln strategizing with General Ulysses S. Grant in a card titled "Council of War" (card number 79). In September, 2009, a PSA 9 card was listed for $49.99; in 2016, a PSA 9 sold at eBay auction for $112.50, with the second-highest bidder casting a bid for $110. In 2009, a PSA 8 was listed for $34.99 by two different sellers. You can pick up a non-graded excellent card for less than $10. 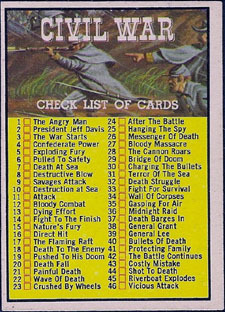 There are 88 cards in the Topps 1962 Civil War News series. It's not a collection for the faint of heart because it graphically depicts the horrors of war. A set of all 88 from a recent Cello pack opening sold on eBay on September 22, 2009, for $750. 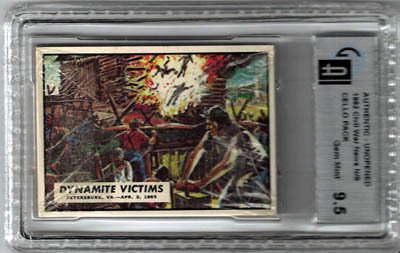 This ungraded Attack card (number 11) sold on eBay on September 26, 2009, for $19.01. 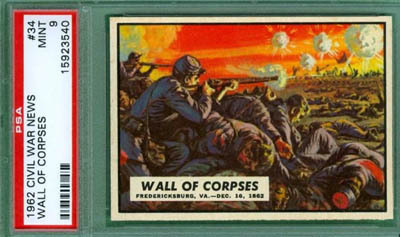 This PSA 9 Wall of Corpses card (number 34) sold on eBay on September 29, 2009, for $161.59. Seller uncommons has many PSA cards listed. 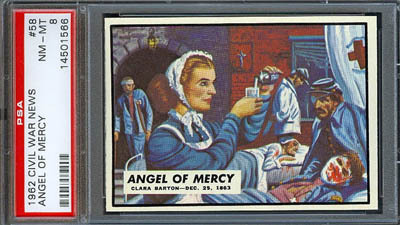 This PSA 8 Angel of Mercy card (number 58) is currently listed as a Buy It Now for $45.00 by eBay seller triplessinc (as of October 4, 2009). President Lincoln met with the commanding officer in charge of the Northern Army, General Grant, this afternoon. The two men discussed the current campaigns and battle plans for the future. Lincoln hopes that the fighting will end soon and that the weary soldiers on both sides will be able to rejoin their families. Military maps were studied by both men and Grant revealed some of the Union's strategic moves to the president. 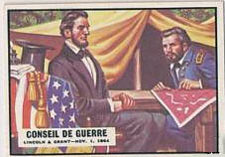 Discussing future plans, General Grant was optimistic that the war would end within the year. He believed that the North's military strength was just nearing its peak and gave as evidence the recent shattering victories over the Confederate Army. Lincoln expressed his great confidence in Grant's decisions. The set was also made in 1965, by A&BC of England. The cards in that set are smaller than the Topps cards. Likewise, there is a French version of the set, with cards the size of the English cards. 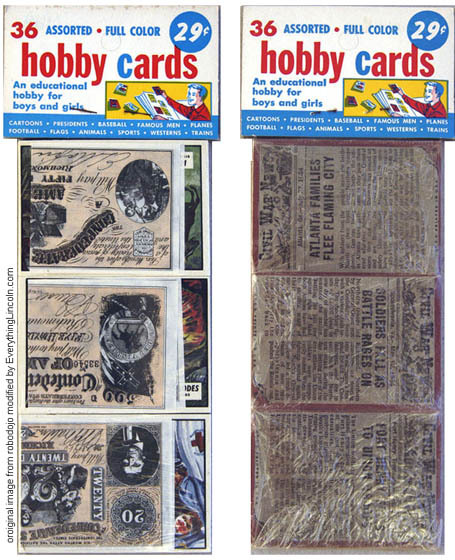 A complete 88 card French set sold on eBay on September 16, 2009, for $547.92. There was also a Spanish set printed in Spain in 1968; many of the bloodier, grizzyly images were redrawn in this set. 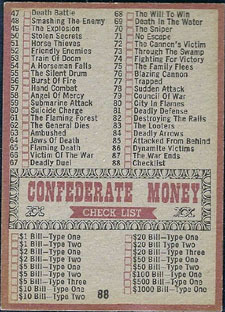 To see the full scans of the French set, visit Bob Heffner's Civil War News French page. He's got some nice scans of the Spanish set also. Scroll down for more pictures including Wax Pack after these listings. 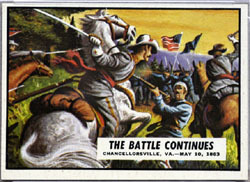 The 1962 Civil War News series shows an illustration on the front of the card, accompanied by a "headline" and a "date line." 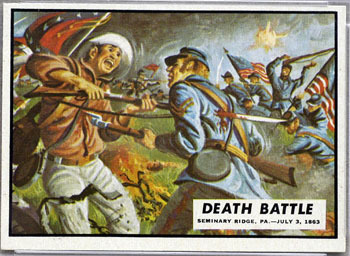 For example, card 47 carries a "Death Battle" headline and a date line of "Seminary Ridge, PA--July 3, 1863." 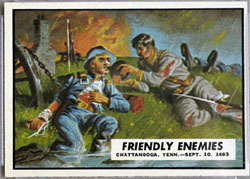 To see the front images of all the Civil War News cards, visit Bob Heffner's Civil War News text page. 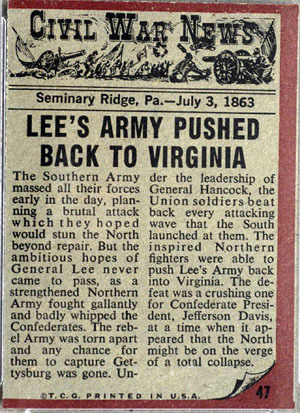 The back of the card uses a newspaper layout and displays a news story about some aspect of the Civil War. 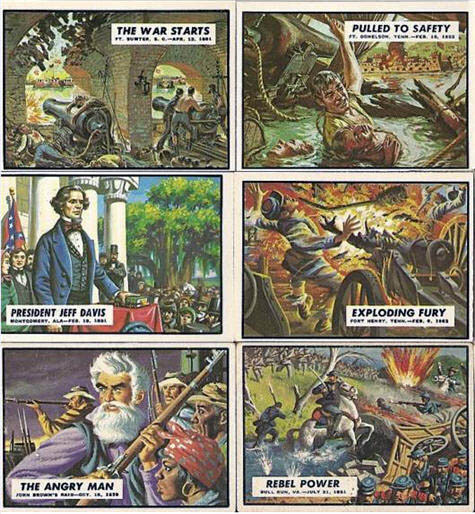 To see the full text of all the stories on the backs of the Civil War News cards, visit Bob Heffner's Civil War News text page. Here is an unopened wax pack and an unopened cello pack. 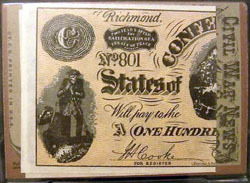 Notice that the back of the cello pack shows an example of the facsimile Confederate currency that was included as an extra. 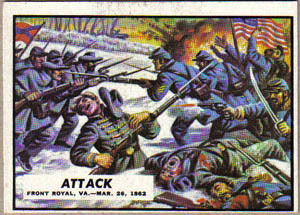 Note that "Civil War" was the official set name, but collectors appended "News" to the name because of the name of the newspaper masthead used on the back of the cards. This unopened cello pack, graded 9.5 by GAI, sold on eBay on September 23, 2009, for $255.01. Shanony, the seller, noted that the centering on the face card was well centered, as was the card on the back. The listing was viewed 87 times and had 10 bidders competing for it. 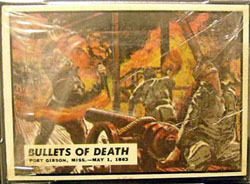 This outstanding 1962 Topps Civil War News rack pack sold on eBay in October, 2009, for $699 (only one bid received in the auction). It was sold by robodojo, who often has some great pieces to sell! 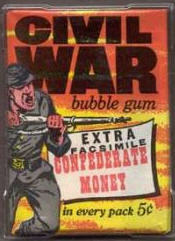 In December 2009, upsalaallamerican sold a 1962 Civil War rack pack in similar condition on eBay for $654. The auction started for $169 and got nine bids from eight different bidders. It came out of a rack pack box the seller once owned. He opened all of them except this one. At over $600, he may have wished he'd left a few more unopened! 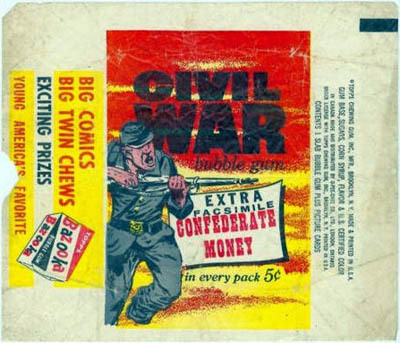 You can see a Civil War News box at the bubblegum-cards site. Copyright © 2005-2016 Alta Omnimedia. All Rights Reserved.